L'actriz britanica Maggie Smith, en una imachen de 2007. Maggie Smith (Nombre artistico de Margaret Natalie Smith), naixita de Londres o 28 d'aviento de 1934, ye una destacata actriz britanica, activa en o cine britanico dende primerías d'os anyos 1950 y con quantos premios recibitos mientres a suya carrera cinematografica. D'entre a suya filmografía, se puet destacar as suyas interpretacions en bellas cintas, como Nowhere to Go (1958, Seth Holt), The V.I.P.s (1963, Anthony Asquith), Othello (1965, Stuart Burge), Young Cassidy (1965, Jack Cardiff y John Ford), The Prime of Miss Jean Brodie (1969, Ronald Neame), Travels with My Aunt (1972, George Cukor), Death on the Nile (1978, John Guillermin), California Suite (1978, Herbert Ross), A Private Function (1984, Malcolm Mowbray), A Room with a View (1985, James Ivory), The Secret Garden (1993, Agnieszka Holland), Tea with Mussolini (1999, Franco Zeffirelli), Gosford Park (2001, Robert Altman), u Ladies in Lavender (2004, Charles Dance). L'actriz Maggie Smith recibió un premio Oscar a la Millor Actriz en 1969 por a suya interpretación de Jean Brodie en a cinta The Prime of Miss Jean Brodie, dirichita por Ronald Neame. Se veigan as imáchens de Commons sobre Maggie Smith. (en) Maggie Smith en IMDb. 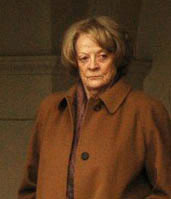 (en) Maggie Smith en Internet Broadway Database.